Las Vegas features a giant that dwarfs even the mightiest casino. That giant is Mt. Potosi, which looms high in the southwestern sky and can be seen from nearly every vantage point in town. You can’t see it if you’re standing behind the Luxor, or Caesar’s, or the other casinos, but if you’re out and about, Potosi can’t be missed. Potosi is where life ended for Carole Lombard and where life began for Fireball. Each year when I’d visit Las Vegas on business, there would be Potosi, never an inviting sight, but always a compelling sight. I knew the wreckage of Flight 3 was up there, and I knew that one day I would go see it. This is not new information to anyone who has read the book, but I bring up the subject of Potosi again because I just returned from my most important visit yet to Las Vegas after four TV interviews and two on radio, and a Saturday lecture at the impressive Sahara West Library on Sahara Avenue. Sahara is a street that’s important to the narrative of Fireball, because at the intersection of Sahara and Las Vegas Boulevard, Clark Gable spent the longest weekend of his life, waiting in a bungalow under heavy guard at the El Rancho Vegas Hotel for word on the fate of his wife. Back then the El Rancho stood alone in desert as the southernmost point in town and the first of the modern casinos. Now the site of the El Rancho is one of the last remaining empty lots in that stretch of the Vegas Strip. Nothing’s been there since the main building, the Opera House theater and casino, burned to the ground in 1960 during a Betty Grable appearance (Betty reportedly lost $10,000 in costumes that night). The owner tried to keep going on just the cluster of bungalows around the casino-in-cinders, but it didn’t work. One of those bungalows had been Gable’s, and I have stood at the spot and pondered what he went through that weekend as he stared at Potosi, what his MGM handlers went through, and Gable’s friends, who rushed to his side by the carload when they heard that Carole’s plane was down. My appearance on that street, in that city, with Potosi visible just to the southwest, was what I can only describe as meant to be. The first modern Las Vegas casino complex, the El Rancho Vegas, along Highway 91 just south of town. Here Clark Gable endured the longest weekend of his life. On Saturday the story poured out of me to the assembled crowd of locals; I showed two videos and then came the Q&A. It was fantastic to get the perspective of people who have lived with the story all their lives. One woman remembered as a little girl looking at Potosi and seeing the polished aluminum of the wreck gleaming in the sun. TWA had tried to dynamite the mountainside to cover over the site, but their plan failed and locals for years afterward remembered the eerie, reflective glow of the right wing against the cliff wall. 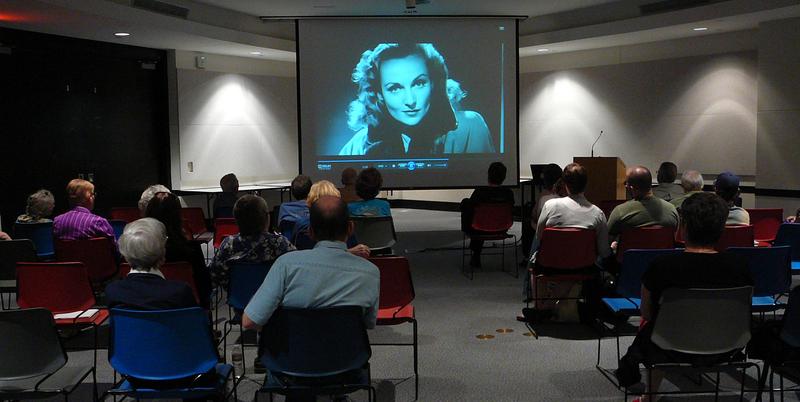 Attendees of the Sahara West event watch one of the GoodKnight Books videos. 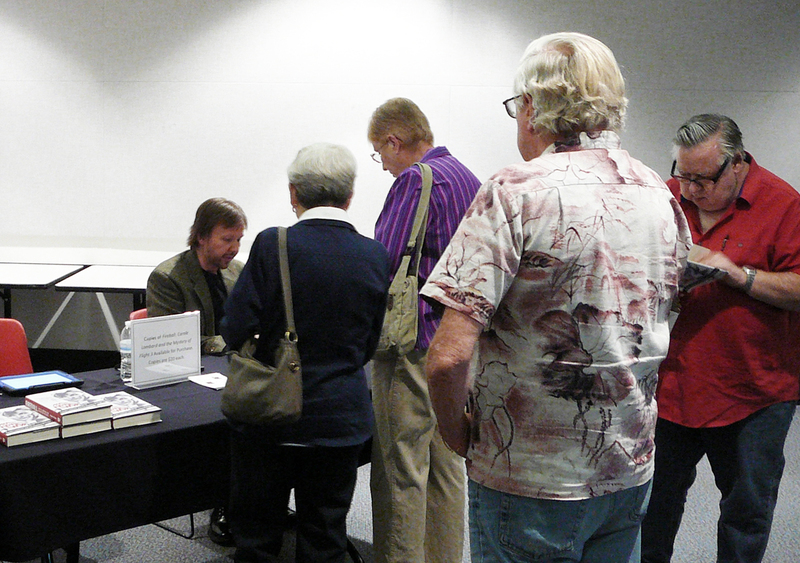 Attending on Saturday was well-known Southern California poet Lee Mallory, whose father and stepfather were pilots. Lee’s Uncle Harry grew up in Goodsprings and learned about the crash and aftermath from people who lived it. In fact, those eyewitnesses passed on relics from the crash to Harry, who had them built into a shadow box with brass name plates, and this incredible history display is now in Lee’s possession. Lee hadn’t yet read the book but was able to pepper me with questions that hit on many key facts and myths related to the event. Another attendee firing impressive questions was named Dennis. He had visited local spots connected to Flight 3, like the site of the El Rancho and the Pioneer Saloon in Goodsprings, where Gable supposedly drank his way through the weekend. No doubt the Pioneer was a player in the tragedy, if not Gable’s home base, because it was here that reporters congregated during days of rescue and recovery. It was a practical matter: in an area so remote, the Pioneer featured the closest telephone and the best way for reporters to get their stories out. Signing books after the lecture and Q&A. The Sahara West Library is a state-of-the-art facility. I haven’t seen better audio and video capabilities anywhere, and I want to thank Marci Chiarandini for fantastic support throughout the planning and execution of the event. We also snuck down to L.A. for a couple of days. I paid my usual respects to Carole, Clark, and Petey at Forest Lawn, and we stopped in at Maria’s Italian Kitchen in Encino, which is currently featuring a Fireball tie-in. Patrons bringing a copy of the book into the store receive a discounted meal. The crazy thing is that Maria’s is located near the corner of Ventura Boulevard and Petit Avenue, and Petit Avenue was the address of the Gable ranch. George Healy of Maria’s, who read Fireball and has become one of its leading proponents, wasn’t aware that one of the key locations in the book was less than a quarter mile away! It’s just the latest in a thousand weird little coincidences and ironies around Fireball, which is a very special book to me and, as I’m finding, to a growing number of people around the country.